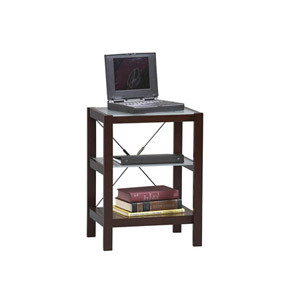 Create an elegant home office with the minimalist look of this Espresso Finish Printer Stand. Ideal size for most printers. Additional shelves for printing supplies, literature, or your favorite collectibles. The rich espresso finish and 2 frosted tempered glass shelves give this printer stand a sleek look. The crossed wire supports add stability to this unit, and form an X-pattern behind the frame.